As the orchestra begins to play at the front of the stage, Janiah C. Lockett ’20 walks on to the stage to deliver her solo as Colonel Fairfax, a statuesque replica of the Tower of London standing behind her. This is the Harvard-Radcliffe Gilbert and Sullivan Players’ production of William S. Gilbert and Arthur Sullivan’s, “The Yeoman of the Guard: or The Merryman and his Maid.” It’s a comedic opera set in the 16th century that follows Phoebe Meryll, a young woman, who is in love with Fairfax, a colonel unjustly sentenced to death. She and her father, Sergeant Meryll, decide to save Fairfax’s life by disguising him as her brother, Leonard. Their elaborate ruse slowly falls apart with the introduction a pair of entertainers, Elsie Maynard and Jackie Pointe. It will be running from Mar. 24 to Apr. 1 in Agassiz Theater. Lockett, who plays the traditionally male role Fairfax, agrees. “It [also] connected me to a long tradition of operatic and Shakespearean acting where a lot of the times the actors are playing an opposite gender.” In some ways, Lockett views the setting as an essential part of making elements like the female-heavy cast stand out. “The traditional set allows the bold moves with casting to shine through,” she says. 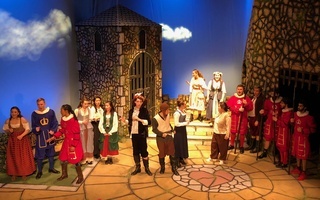 The show’s design and lighting are particularly special due to their elaborateness according to technical producer Michaela J. Kane ’18. “[For the Tower,] we created a compound with a mix of glue, paint, and rolatex to create three-dimensional flagstones,” she says. The lighting is also very stylized to create different moods for each character. “The cyc, the blue tarp that surrounds the production, takes colour really well….We have given each character a colour palette. Fairfax is purple. Elsie is pink. This both heightens the mood and creates patterns which can then be broken. As Elsie is devastated, [for example], the sky becomes a corruption of her pink,” Kane says. With its unusual but exciting casting, Kane and her colleagues hope “Yeomen of the Guard” will delight.